Glue ear differs from an outer ear infection. 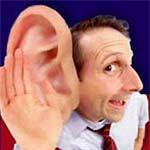 The main symptom of glue ear is the clogged ear, or fullness felt from the ears. Ear infection symptoms include various levels of pain where glue ear generally does not include pain, but only a sensation of ear stuffiness and/or hearing loss. Consequently, these glue ear symptoms can lead to speech and behavior disorders because of the hearing deficits. If left untreated, permanent hearing loss is rare but may occur. Home remedies for ear infections or antibiotics are used to cure the usual ear infections. However, glue ear is not always treated as a typical ear infection. Physicians do not always immediately treat glue ear. It is standard procedure by most doctors to give the condition some time per chance it resolves on its own. Although it may take as many as four months, it is very possible for glue ear to heal independently. If speech seems to be effected or ear infections begin to develop, then treatment would be in order for the glue ear. This will include antibiotics for the patient who is suffering with pain, has an obvious infection brewing, and is experiencing hearing loss. Another treatment is called myringotomy and performed by making a tiny incision in the eardrums to drain the trapped fluids. At this time, ear tube may or may not be inserted. These tubes are known as tympanostomy tubes and are used to allow a better drainage capacity of fluid from the eardrums.